One day while laying in bed, this list of the ABCs of homeschooling came to me. I felt compelled to share these so hopefully this will be helpful to someone. This list encapsulates my approach and thoughts about homeschooling. Homeschooling is very character building for parents as well as students. There are so many thoughts that can make a parent feel like they are not doing enough or not teaching their children correctly. Here is my encouragement to all homeschoolers. I hope this list of the ABCs of homeschooling can help someone in their journey of homeschooling. A - Attitude - You've heard it said that "Attitude is everything," well, it is! If we have the right attitude, we can do anything we set our minds to doing. Start each day with the right attitude and you will do well. B - Be Yourself - Many times new homeschoolers take on teacher roles or use curriculum that is not a good fit for their personality style. Just because someone wrote a curriculum for a classroom, doesn't mean we have to use it. Stay true to who you are and choose books and resources that help you be the mom you need to be to your kids. C - Character - If homeschooling does anything, it builds character. Parents are always surprised how much they learn about themselves and how much they need to work on their character when they move through homeschooling. D - Determination - Homeschoolers who are just half- heartedly homeschooling or don't really have much determination to follow through will experience difficulty. We need to be determined to stick with our goals and vision for homeschooling and not let anything deter us from those goals. E - Ears - You were given 2 ears for a reason. Be sure you listen to your children and really hear what they are saying. Are they just whining about having to do math or is this really not the best math program for them? It's OK to switch programs if you feel the need to do that. F - Fun - Don't forget to have fun! The key to avoiding homeschool burnout is knowing when to have fun and when to change things up a bit. G - Goals - We don't have to have every day scheduled out and follow a lesson plan, but we do need to have some general goals set at the beginning of the year. The self-teaching model has parents and students sitting down together at the beginning of each quarter talking about what they want to accomplish. If you don't know where you are going, you will have a harder time sticking with homeschooling and will often feel like you are not doing enough. H -Help - Help your children whenever you can and don't be afraid to ask for help when you need it. Whether you need help teaching a certain subject or whether you need help cleaning your house, make sure you ask (or hire) some help so you can avoid burning out or getting frustrated. I - Interest - Everyone has things they are interested in. Children will learn better if they study things that they are interested in. Try to use your children's interests and weave it into learning. My goal has always been to help my children love learning. J - Jesus - For those that a Christians, Jesus is a great friend. Remember to go to Him often with anything and everything. He's right there ready and willing to help you. K - Kindness - Remember to be kind to your children and teach them to be kind to their siblings. A common phrase in our house is "Meanness will not be tolerated!" L - Love - Love your kids a ton. Smile at them and let them know you are glad they are your kids. Find out their love language and shower them with love whenever you can. M - Make time for Field Trips - What I remember most about my days in public school are the field trips. I love taking my children on field trips. They don't have to be expensive or take all day. Sometimes a simple trip to a bakery, post office, or farm can be just as enjoyable as a trip to a museum. N - Nurture - Nurture your children. They were given to you and you were given to them. You are their mom for a reason and they need you to care for them and be their biggest fan. O - Open your Mind - It's easy to adopt the mindset that we have to read from a lesson plan each day because an expert wrote that out for us to say, but I encourage you to open your mind to new ways of teaching. You are a tutor and don't have a whole classroom of students that need busy work to keep them under control. Explore new ways of teaching and new ideas that might help your child develop a love for learning. P - Passion - Are you passionate about homeschooling and spending time with your children? Keep your calling to homeschooling at the forefront of all you do. You were called to do this and God will keep guiding you and helping you along the way. Q - Quest for Knowledge - Our goal for homeschool should not be to fill workbooks. Although it's nice to see all those books completed, we really want our children to search for knowledge and be passionate about learning new things. If we want to learn something new, we read books, watch videos, or talk to people who know about what we want to know. Our children should be interested in learning about various subjects and we should encourage them to pursue their interests whether that be during school time or after their schoolwork is done. R - Recess - The beauty of homeschooling is that we can take breaks when we want or need them. If we are in the middle of a great project, we don't have to stop because the bell rang. We can keep going. If a child is having a rough time, we can stop and set the timer and tell them to take a break and come back when the timer goes off. S - Sit and Read - Every child that I have met enjoys being read to by their parents. There might be a few out there that don't, but I have never met them. Some children enjoy picture books and some enjoy chapter books, and some enjoy both. Let your children play Legos or do puzzles while you read a chapter book. Read to your children as often as your schedule permits. It will be some of the sweetest times you will remember with your children. T - Time - Another advantage of homeschooling is having lots of time to spend with our children. I think I had an easier time than public school parents when my children graduated because I had lots of time with my children. I got to spend lots of time with them talking, playing, reading, and just plain interacting. I was able to release them to pursue their goals because I had walked through life with them. Public school parents were still trying to capture more time with their kids that they can never get back. U - Undo your public school mindset - I've alluded to this before, but much of the material out there for homeschooling has been written for classroom use. We have the advantage of choosing materials for a tutoring environment. We are tutors and coaches of our children and can choose materials for that environment. V - Values - Another great benefit to homeschooling is that we can instill values and morals into our children. If more of the world had a good dose of values and morals, we wouldn't need so many laws and regulations to help people be honest and do the right things. W - Walk - Take walks around your neighborhood whenever you can. It's a great time to talk about what you see around you or maybe it will give your child some time to share what is on his heart. X - Xtra time - If your child isn't understanding a math concept, go ahead and put the book aside and spend some extra time on math facts for a while until that concept comes into clearer focus. The beauty of homeschooling is that we can slow down or skip lessons and speed up wherever it is needed. Y - Yes - Say "Yes" as often as you can. As moms we often have to say "No" a lot, but let's have some fun with our kids and try to say yes more often. Let them play with playdoh, chalk, markers, go to a park, or make a fort. Your house doesn't have to be a mess, but it can be fun and kids can learn to clean up after themselves after they have had some fun. Z- Zoo - Remember to visit the zoo as often as you can. If you don't have a zoo anywhere near you, plan your vacation near a zoo so that your children can experience visiting a zoo. They are one of my favorite educational places. 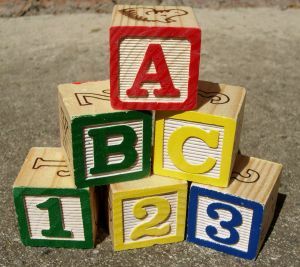 Do you have any other ABCs of homeschooling that you want to add to this list? Feel free to leave a comment. Have A Comment to Make About This Topic? Do you have a great story about this or just want to add a comment? Please share it here!